I was out of town last Sunday, so I didn’t get a chance to wear my red, white and blue to Church and since wearing dresses are one of my FAVES that I usually only get to do on Sundays, I’m doing a “post” red, white and blue look. It’s only a day late for the 4th, so it’s all good, right?!?! I decided to go with my Junieblake Dress cuz, for one, it has (vintage) blue stripes and two, I just LOVE the dress period!!! I pretty much got the idea for this look cuz Junieblake had posted the dress on their Instagram account last week as a July 4th look idea. I just love how the chambray blue gives the dress a vintage blue feel. Then, as I’ve said before, the dress has a 50s vibe to it, giving it even MORE of a vintage feel. 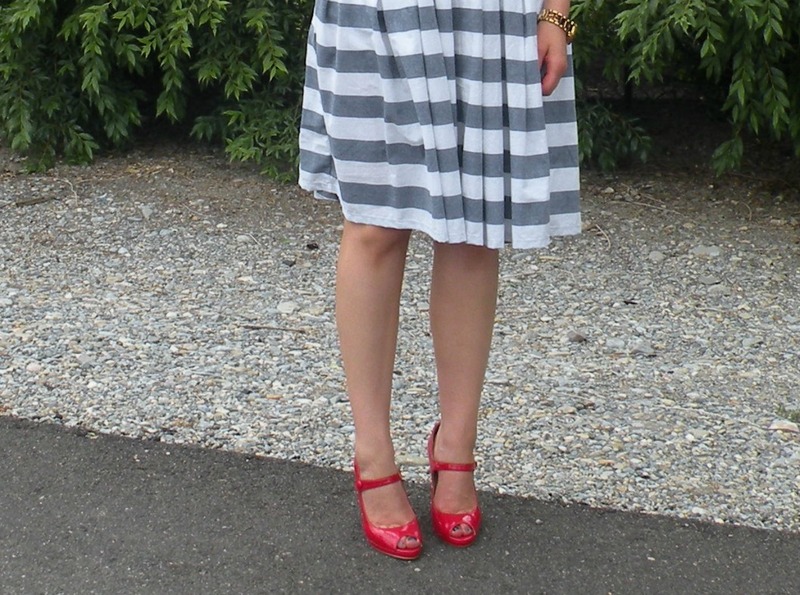 For a POP of red, I added my pair of red patent leather pumps that I’ve had for years. The mary jane style goes perfect with the dress. To keep the shoes as the POP for the look, I kept my jewelry simple with the Natural Charm Necklace by mark. 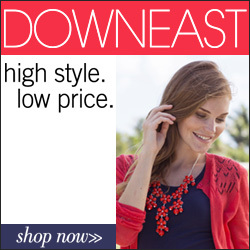 It’s such a great statement necklace, but since it’s in neutral colors, it doesn’t steal the show from the red pumps! 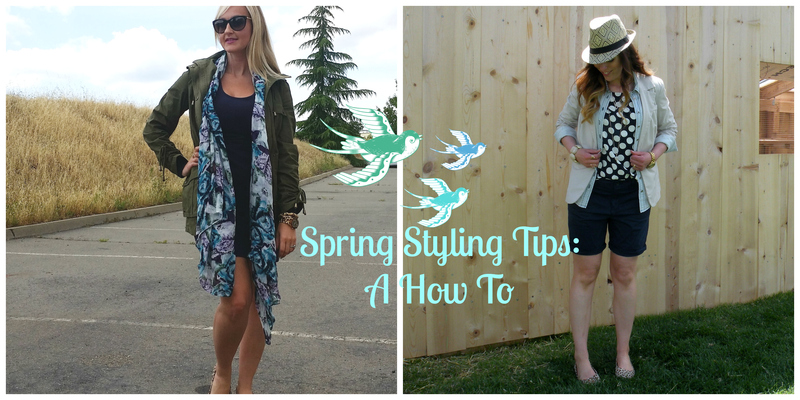 Now that Alicia and I have finished our Spring Styling Tips Series, we thought it’d be fun to each pick one of each others styling tips and recreate the look. I love recreating looks using pieces from my closet, so I had a lot of run with this one. Of course everything isn’t going to be exactly the same, but that’s the whole point! Showing that YOU can easily recreate our looks too! The look I chose to recreate was Alicia’s Spring Layers look. Here’s her look…. And here’s how I recreated it…. For the bottom layer, Alicia suggested going with something cool enough for the warmest temps of the day. 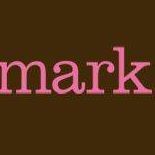 She suggested something like the mark. Easy Does It Romper, shorts, tank, ect. Since I don’t have the romper in my closet, I chose a pair of navy boyfriend roll up shorts to keep the colors similar. Then since I was wearing separate pieces, rather than the one piece romper, I decided to go with a navy and white polka dot top rather than a solid navy top for visual interest. For this step, Alicia suggested layering lightweight fabrics over the bottom layer so they don’t look bulky and out of season. Lucky for me, I actually have the exact same blazer as Alicia! That’s because it’s a mark blazer from a few years back. 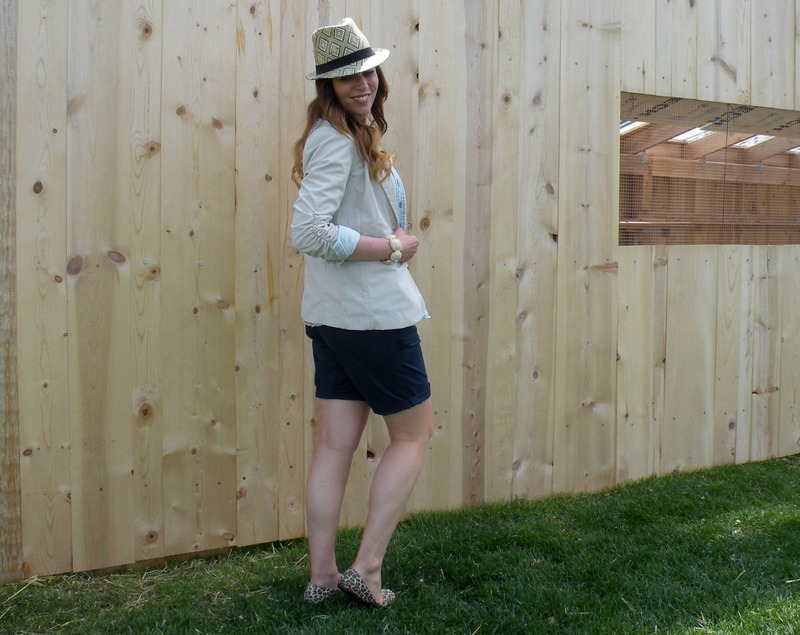 The blazer is definitely light weight and the perfect color for Spring. Next Alicia suggested layering more than one layer because it not only gives your look more dimension, but it’s also functional. It gives you one more layer in the cool early morning and allows you to remove layers as the day warms up. I actually ended up wearing this look the rest of the day after doing the shoot just cuz I loved the look so much! It was a cooler day so I removed the blazer and just wore the look with the chambray button up. Alicia recommended that if you’re going with multiple layers, to keep them in the same color family. She said by keeping a like color scheme, it will keep you looking put together rather than hodge podge. She said you could add a print, but keep it in the same color family. I did this by adding the polka dot print top. As I said early, the top is navy and white, so I’m keeping things in the same color family with it. As Alicia also said, leopard is also a neutral. I added a leopard flat to the look like she did. I love how they add a lil visual interest to the look without looking crazyish. Now is the time Alicia says to bust out the Spring Accessories! Things like straw hats, beachy bracelets and shimmering spring accessories. Since the Twice as Nice Necklace Set, Cube Affects Necklace and bracelet Alicia is wearing in her look are by mark, I happen to have the same ones in my jewelry collection, so I decided to add the same pieces for my look. Then I also added the mark Tool Around Ring Set and a watch cuz I ALWAYS have to wear a watch! Then I added my straw fedora hat to top things off like Alicia did. 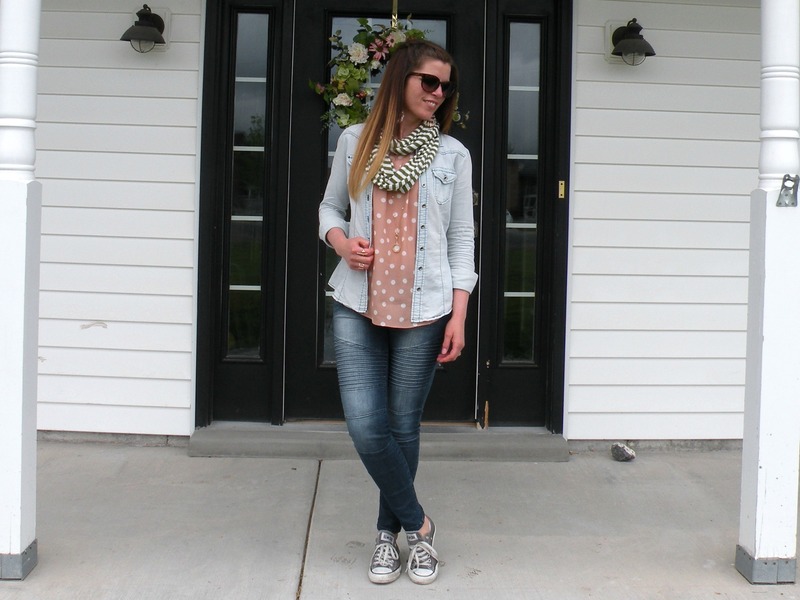 Alicia also chose to recreate my Spring Layers look using the mark Luck of the Drawstring Anorak and mark Four Seasons Scarf. The jacket and scarf are perfect for the cooler mornings. Then they can easily be removed once the temperatures rise! I LOVE how the jacket and scarf style beautifully together along with her neutral bottom layer. The deep purples in the top really make the purples in the scarf just pop! 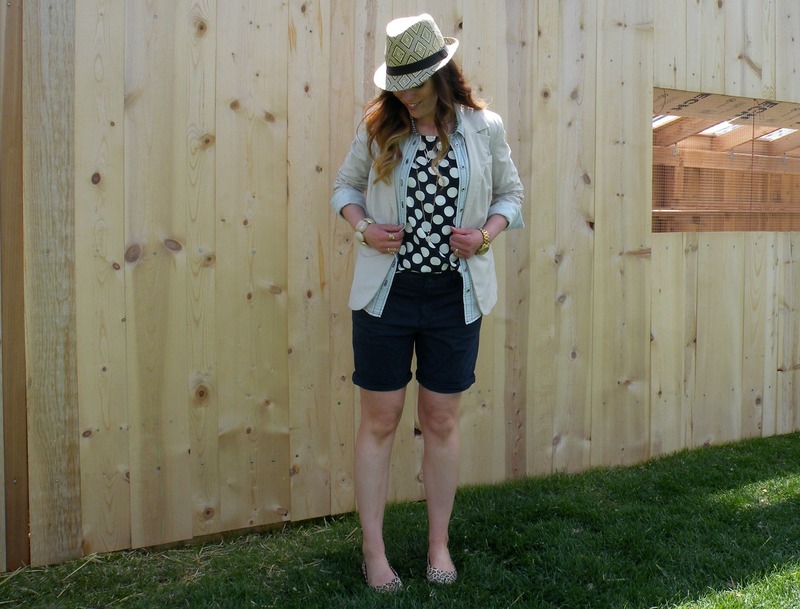 See more pics and read how Alicia recreated my look over on her blog, Word of Alicia. Joggers are definitely all the rage this season, and I’ve jumped on feet first! I love ’em because they are loose fitting and comfortable, plus they’re light weight and flowy. Joggers are the perfect thing to wear on those HOT summer days when I just didn’t have enough time to break out the razor in the morning. For me, joggers also make a great substitute for wearing a skirt. I LOVE wearing the cute printed skirts, but it’s just not very practical where I work. So a printed jogger is the next best thing! They come in such fun prints that can be easily mixed and matched with printed tops, similar to what I like to do with a printed skirt. 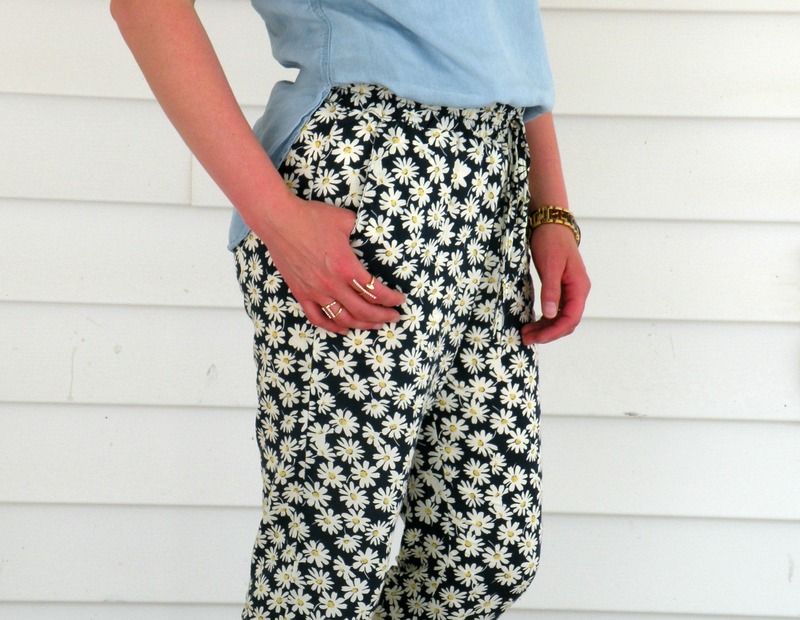 I’m especially in LOVE with the daisy print on these joggers I found at Arrow Twenty Two. Couldn’t be a more perfect print for summer and they’ll mix really well with other prints like a striped or polka dot top. I can see these being on a heavy rotation in my closet this summer! 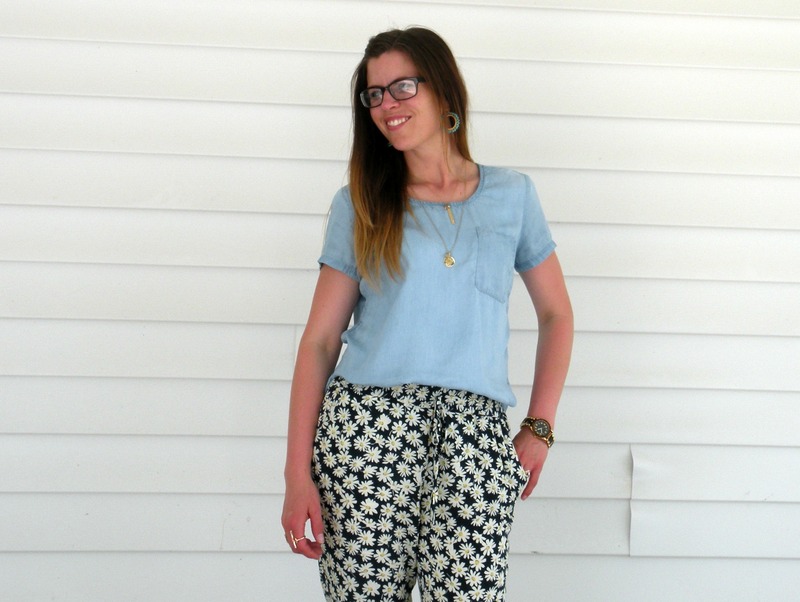 To style a jogger pant, pair it with a loose fitting top. To keep your look keeping casual, only tuck the top in on the front. This will define your waist and keep you from looking frumpy. You could fully tuck in your top if you’d prefer, but keep in mind this will give you more of a dressy look rather than a casual one. Add simple layered necklaces to keep things looking light and easy going. Plus a pretty set of simple rings like this mark Hint of Bling Ring Set. So simple, yet SO pretty! Then finish off the look with a cute pair of sandals or slides like these Contour Lightweight Sliders from Avon. They come in a neutral silver that’s perfect for all your summer looks. P.S. Slides are a HUGE trend this season. Just cuz its casual Friday, it doesn’t mean t-shirt and jeans. Think of it more as semi-casual with a pair of jeans and a nice top. My lifestyle is pretty casual, so my outfits everyday tend to be semi-casual. If you work in a place where it’s more of a business look everyday during the week, you don’t want to go from a business look to t-shirt and jeans. That’s way too drastic of a change, plus a t-shirt and jeans just looks unprofessional. 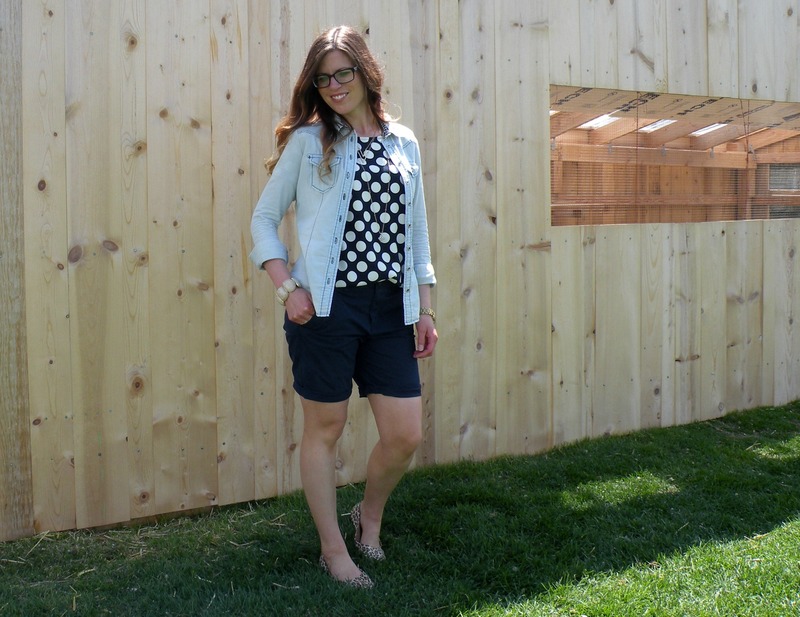 Try a flowy top with a chambray button up layered over the top. 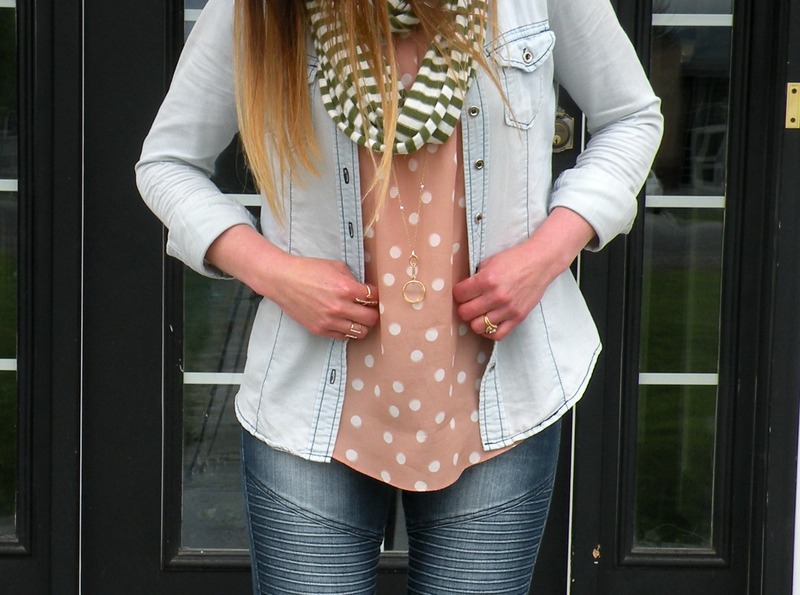 Then for a lil more visual interest add a printed knit scarf layered with a long pendant necklace. For a fun look to my hair and to just keep it out of my face, I did a partial French braid on the side. I then pinned it in place with a couple bobby pins. I really like the way it turned out and just might have to do that more often! To keep the look on the casual side, I paired it with a distressed pair of motto jeans (my fave these days) and my Chuck Taylors. 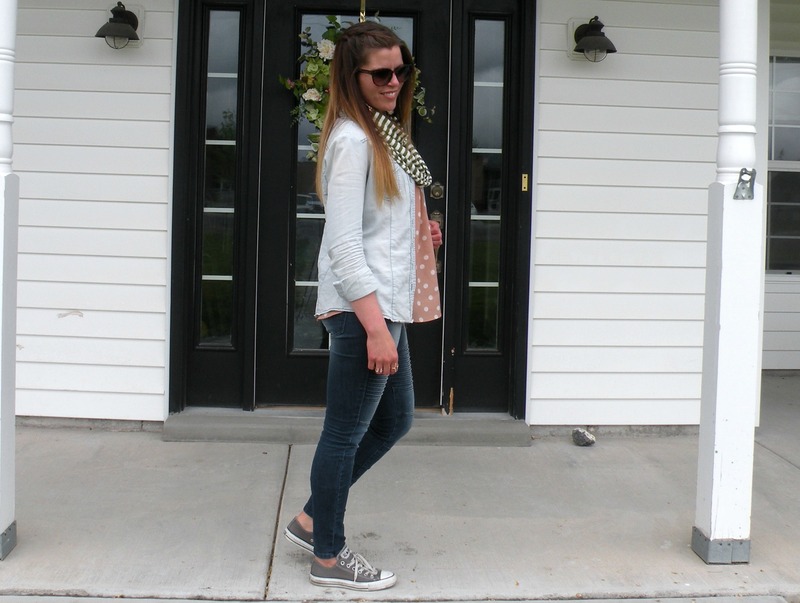 Chuck Taylors (or Converse) are always a great way to take a look to the casual side. They add a bit of funkiness to your look and are a lil more dressy than just your average pair of sneakers. To add a final touch of coolness, I’m LOVIN the new Throw Some Shade Sunglasses by mark. The tortoiseshell frame is super chic and the frame shape is super flattering for any face! 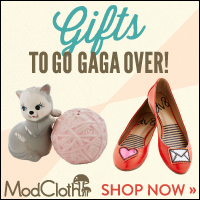 They make it easy to get your cool on! 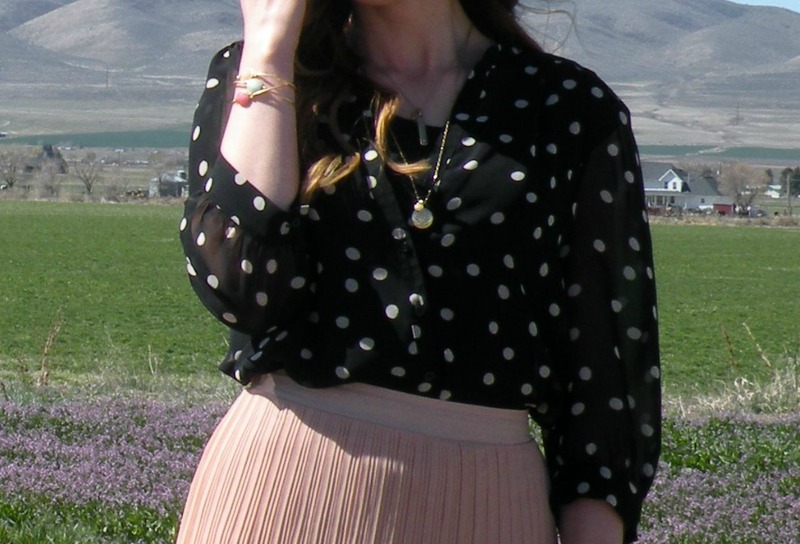 I LOVE mixing up the prints, so I couldn’t help but put this floral top and polka dot skirt together. The key is to make sure the prints aren’t competing with each other. 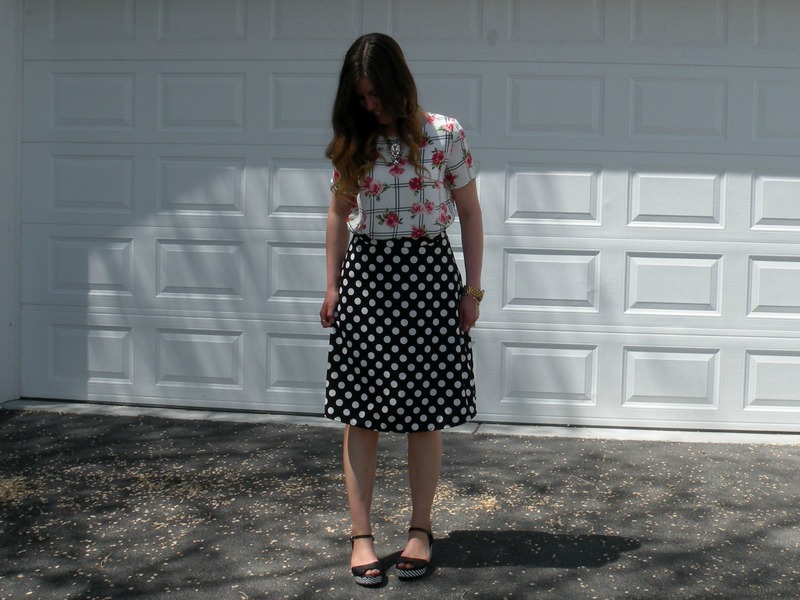 For me, I do this by making sure one of the prints is in neutral colors like the skirt. Then I added color with the florals in the top. The black and white windowpane print in the top also adds another bit of print and helps tie in the black and white in the skirt. Then the print on the sides of my platform shoes added a touch more of print. Altogether I have 4 prints going on in the look, but they all compliment each other, rather than complete so the look is in harmony. I wore this outfit to church and had a lady say to me, “flowers and polka dots huh? I guess that’s in these days.” Keep in mind this lady usually compliments me on my outfits, I guess the print mix was just a lil too much for her. I actually doesn’t bother me when people comment on my outfits. If I like them and feel good in them, that’s all that matters to me. Like they say, to each his own. I’ve been so busy the past few months that I haven’t had a chance to put together a “1 piece, 4 ways” post, but I’m SO in love with the new Dark Endings Maxi by mark that I just HAD to take the time to put a post together. 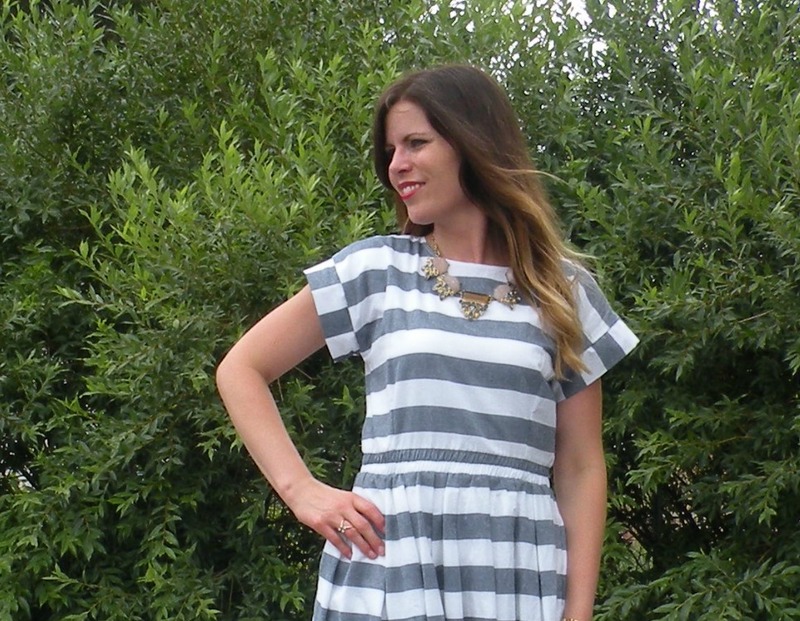 The maxi is so long and flowy, it just makes you feel so pretty when you wear it. The fabric is a light chiffon. So perfect for Spring and Summer. The pleating adds the perfect touch of detail to the skirt. 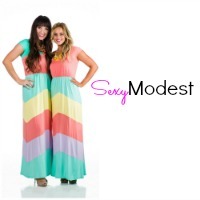 Plus you’ll be right on trend cuz both maxis and pleating are both in right now! The mauve pink is the perfect transition color from Winter to Spring colors. Not too bright, but brighter than the Winter colors. 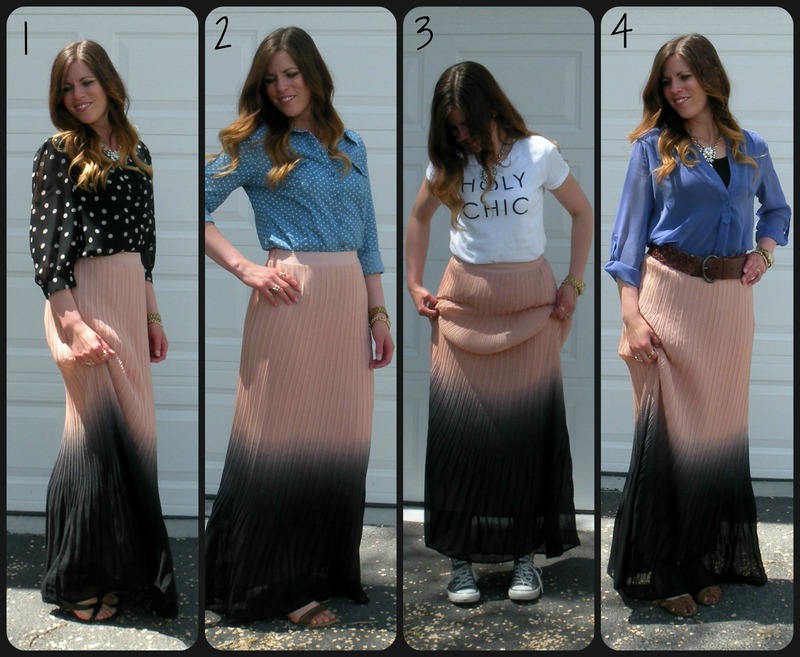 Now before I just keep rambling on about how much I LOVE the maxi, let me share with you 4 different ways of styling it. 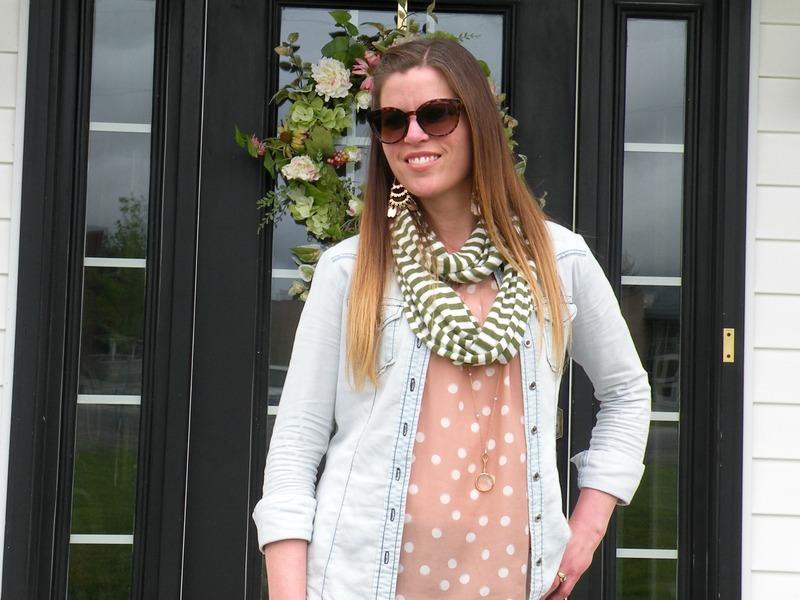 The first look is dressing it up as I did in my previous post with Alicia from Word of Alicia, in our posts “Spring Styling Tips: Spring Colors“. I dressed it up by pairing it with a similar chiffon fabric in black and off white polka dots. The black in the top perfectly matches the black in the bottom of the skirt, while the off white polka dots compliment the mauve pink in the skirt. 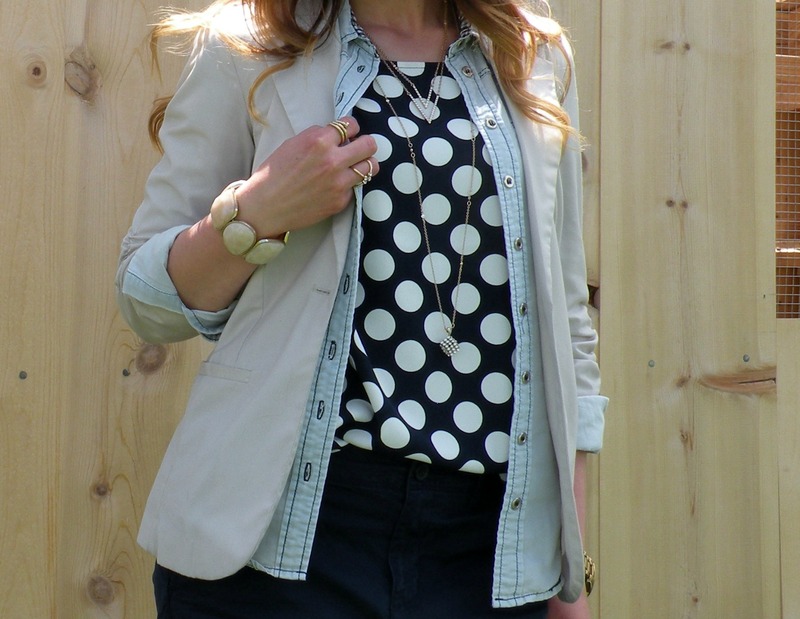 The polka dot print in the top adds just the right amount of visual interest to the look. I paired the skirt with a strappy black sandal that are both dressy and casual at the same time. 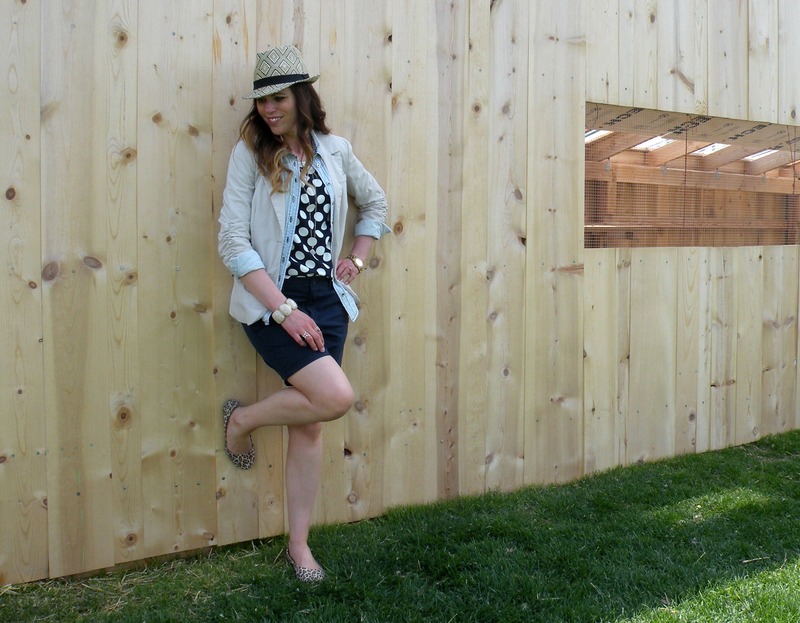 Go Semi-Casual with the skirt by pairing it with a chambray top. 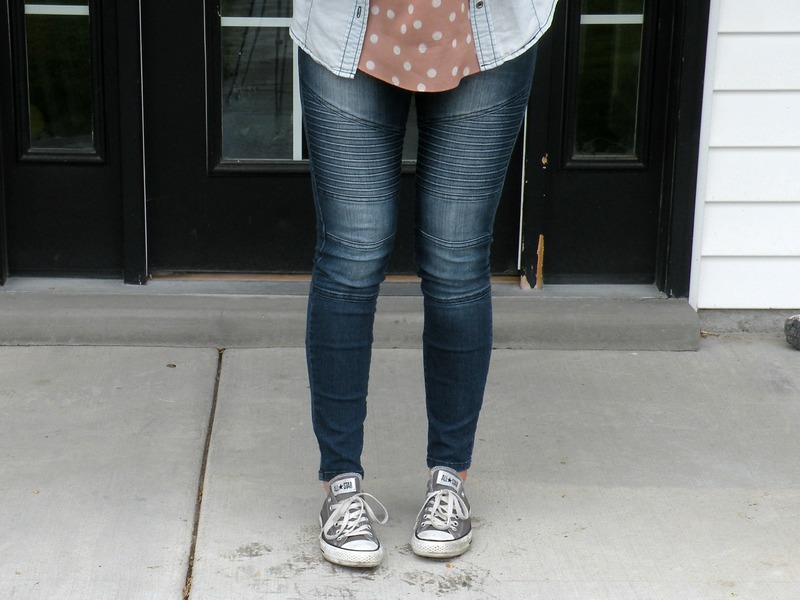 Chambray is one of my FAVE tops to style. It easily takes a look from dressy to casual. 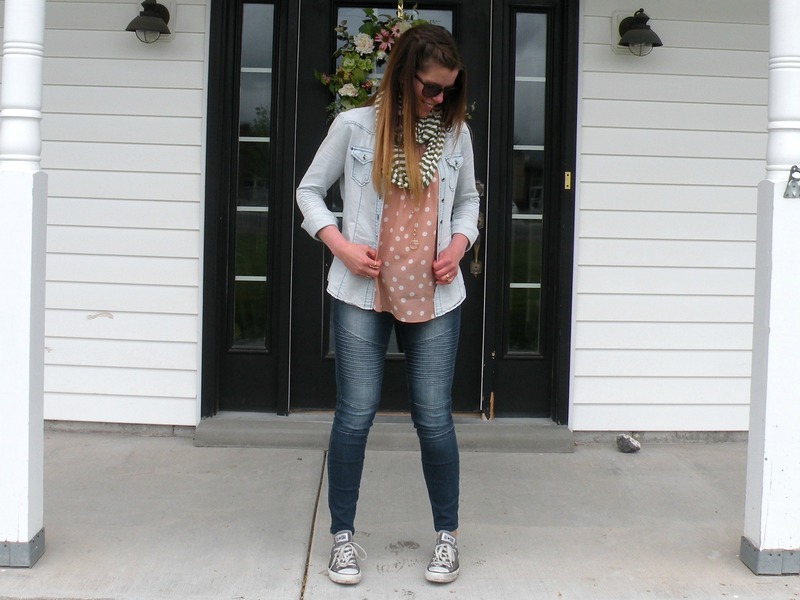 A chambray with polka dots is even more fun! Add a pair of strappy brown sandals to keep the look on the casual side. I REALLY love the look of a graphic tee and sneakers with a skirt. Since I can rarely wear a skirt other than to church, it’s just not something I usually get to do. 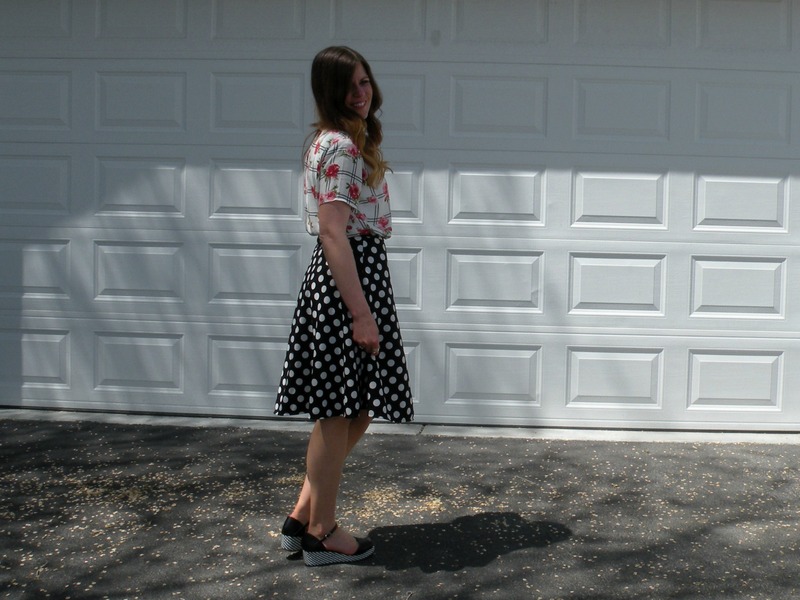 I just don’t feel church is the place for sneakers and skirts just aren’t practical for me to where I work, so it’s a special treat for me to wear them together on the blog. If you can fit them into your wardrobe, I would recommend them! Even if it’s just on a casual Friday or weekend shopping. It’s just such a super fun, casual chic look! To dress up the look just a little, you could add a skip the sneakers and add a pair of strappy sandals instead. Style the skirt with color by adding a top in a color that goes with the mauve pink of the skirt. I chose a periwinkle chiffon top that was already in my closet. To change things up a bit from the other looks, I added a belt around my waist. If belts aren’t your thing, you could easily just skip it. Then I added another pair of cognac strappy sandals to keep the look on the semi-casual side. To make this look dressier, go with a black belt and sandals instead. 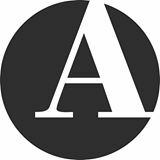 Spring is the time of year that everyone wants to start freshening up their wardrobe. Everything around you feels fresh and new which makes you want to feel the same. A good way to start is with Spring colors. 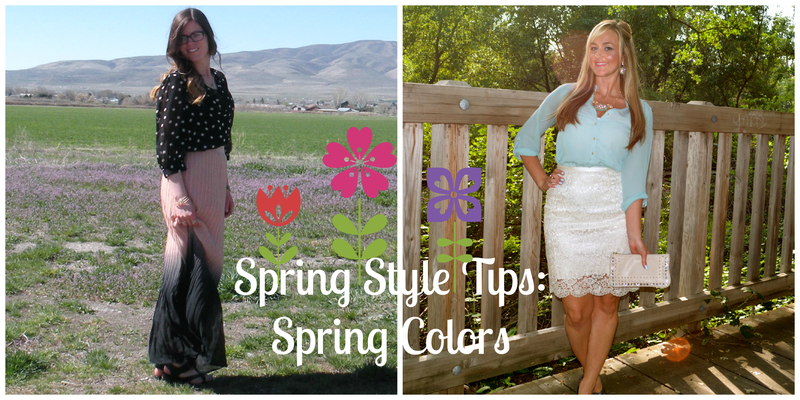 For this edition of Spring Styling Tips, Alicia from Word of Alicia, and I are sharing tips on adding Spring colors into your wardrobe. 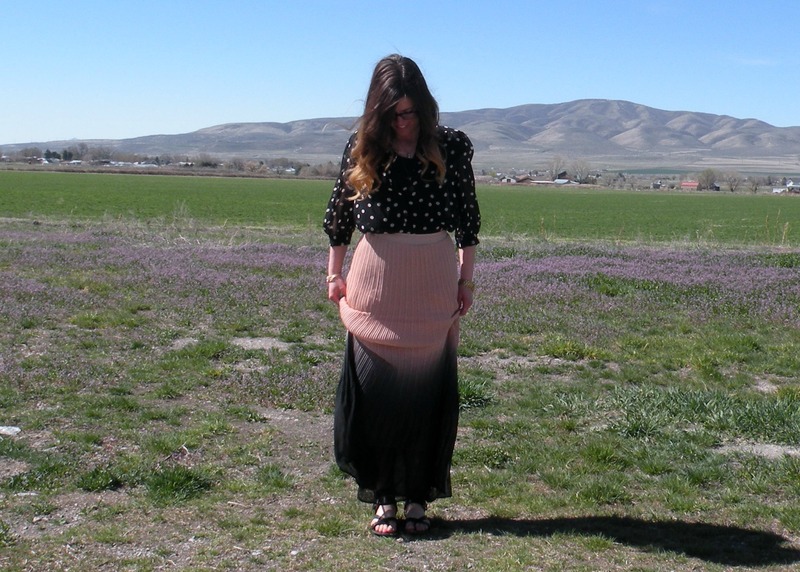 A good way to start is with a Spring colored skirt like the Dark Endings Maxi Skirt by mark. I’m not big into bright, bold colors for Spring. 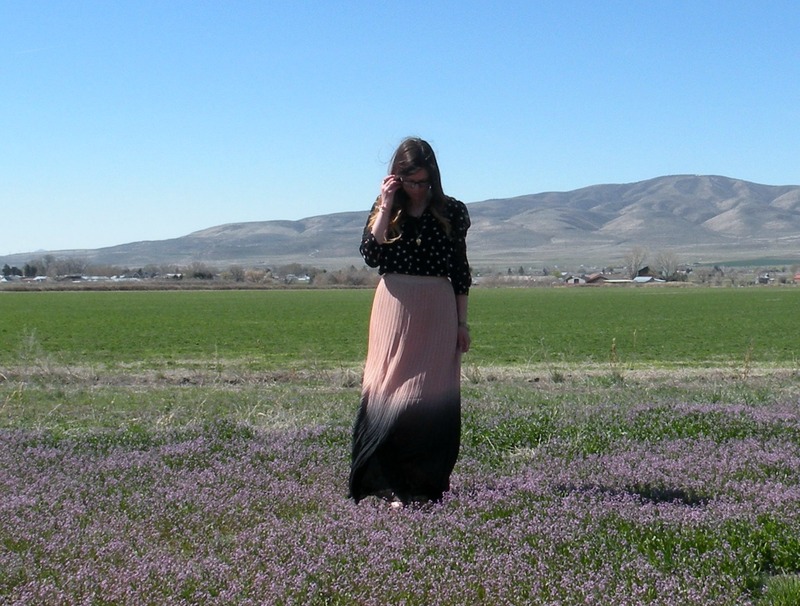 I like the more muted colors like the mauve pink in this maxi. 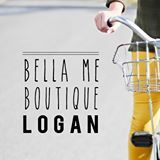 It’s the perfect way to start breaking away from those darker colors of Fall/Winter and start brightening up your wardrobe. 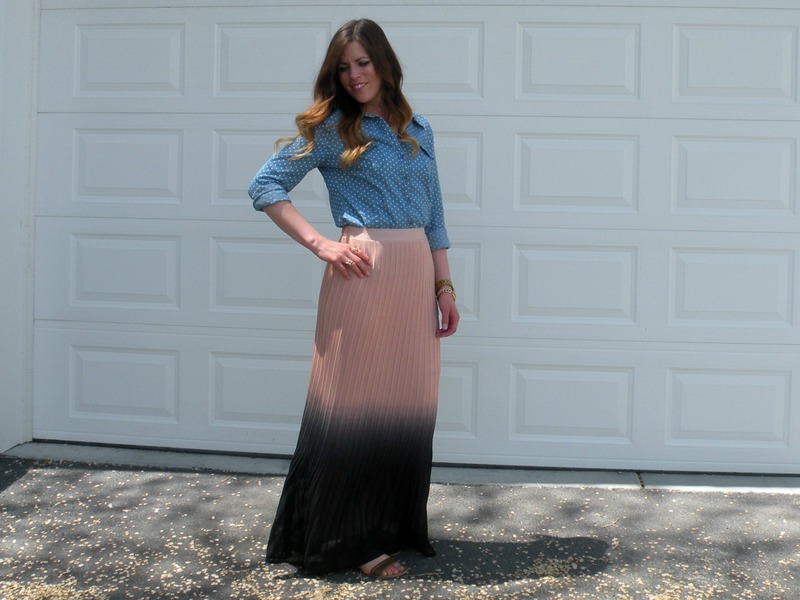 The black fading on the bottom of the skirt creates the perfect ombre effect which is right on trend right now. Speaking of on trend, the accordion-pleating on the skirt not only adds a beautiful detail to it, it’s also right on trend! 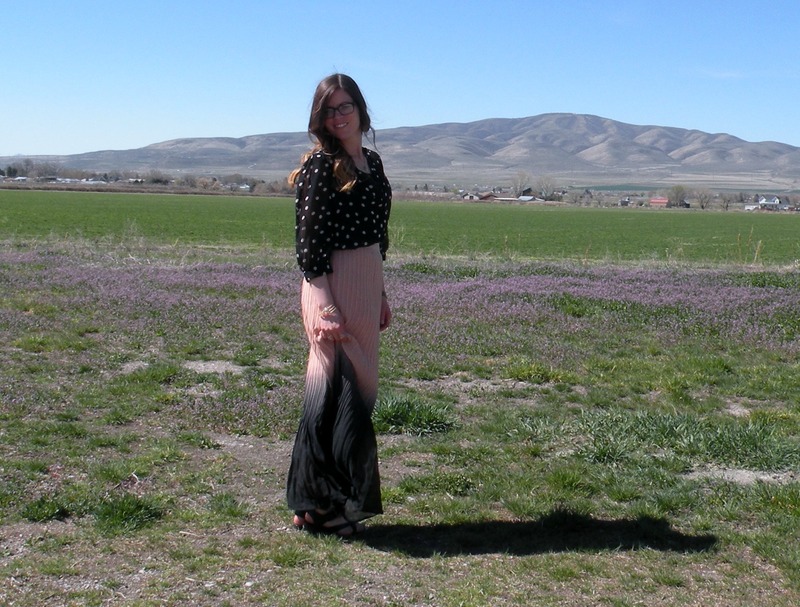 The long flowy chiffon maxi skirt will also make you look tall and slender and feel beautiful at the same time. To add some visual interest to your look, pair the skirt with a printed top that goes with the black in the bottom of the skirt. 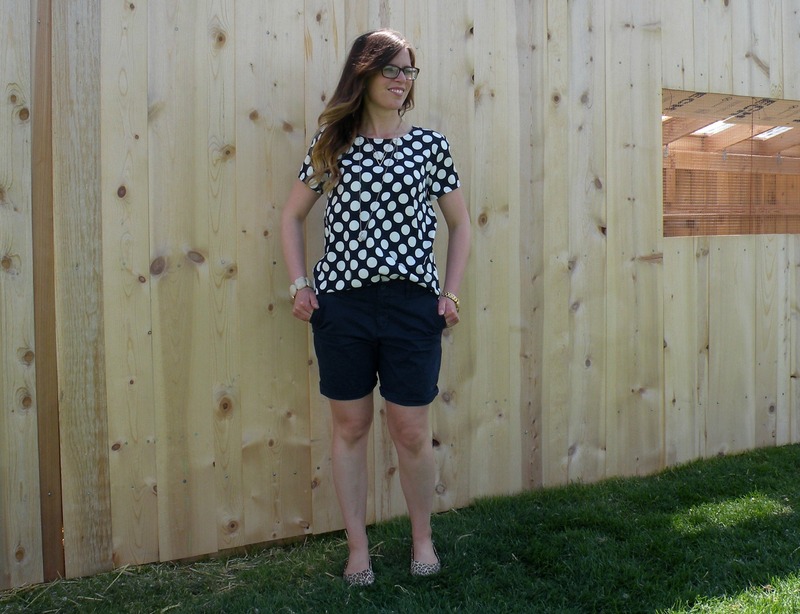 A black chiffon top with off-white polka dots is the perfect choice. 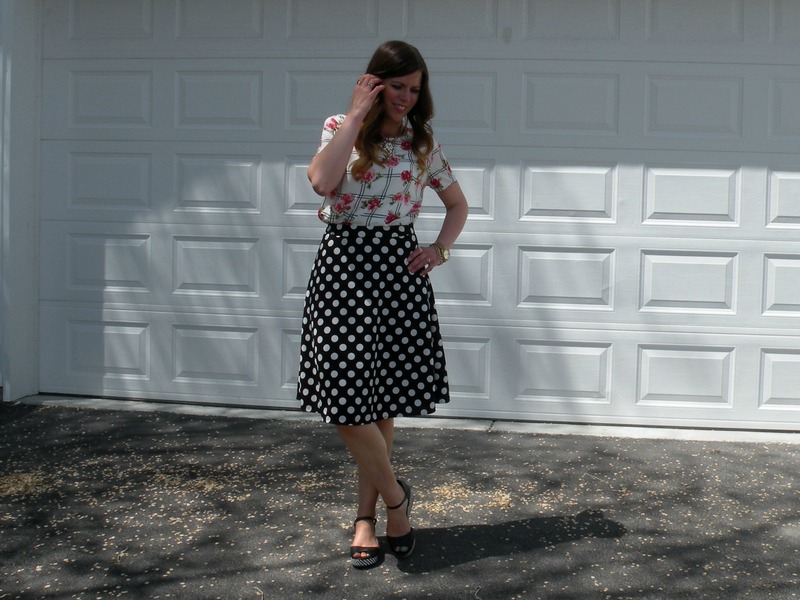 The fabric is flowy like the skirt and the polka dots add just the right amount of contrast without being over powering. Plus the off-white dots are in a similar color tone as the mauve in the skirt so they compliment each other perfectly. With colors getting lighter, so is the jewelry. Put away your big statement pieces for now and go with simple layered necklaces and bracelets. They not only look simple and elegant, but they also give you a lighter look and feel. The Three Of A Kind Bracelet Set by mark makes the perfect simple bracelet set for Spring and into Summer. Finish your look with a pair of black strappy sandals. It’s Spring time, so that means it’s time to start showing off those pretty painted toes. The best way to do that is with an adorable pair of strappy sandals. They’re also perfect to wear with a long maxi skirt. P.S. The day I did this shoot, it was a pretty windy day. It was quite the challenge to keep my hair outta my face AND keep the skirt from flying up too much. Haha! I think I was able to come up with a few shots that turned out decent and show off how beautiful the Dark Endings Maxi is. Go to Alicia’s blog at Word of Alicia to read her full tips and see more of her pics! I really adore the Fancy Flora Collection she’s wearing in today’s post. She styled it perfectly!